A warm Cornish welcome and tranquility awaits at Carkeen, North Cornwall. Follow the private sweeping driveway and arrive to the wonderful stone farmhouse set within acres of established gardens. 4 luxury bedrooms offer spacious accommodation for up to 8 guests whilst 3 reception rooms and large kitchen bring friends and family together to relax and enjoy some well earned time together. Carkeen is set within easy access of the North Cornish coastline and the golden sand beaches of Polzeath and Trebarwith Strand. The picture perfect village of Port Isaac is a short drive away offering tempting places to eat and beautiful coastline to explore. Ample parking. Carkeen welcomes up to 2 well behaved dogs. Carkeen is a beautiful stone farmhouse set within private grounds. Arrive to a convenient boot room with ample space for all your holiday kit and supplies for the perfect week, the cool slate pantry helps keep the kitchen decks clear and offers additional storage space. Lead into the farmhouse kitchen with modern twist. This inspiring kitchen is perfect for large group catering with all you could need to prepare a slap up supper or lazy Sunday brunch. The dining room is set just off the kitchen with large dining table and 8 dining chairs; this beautiful room welcomes celebrations in all seasons and offers a large traditional wood burner for cosy winter weekends. 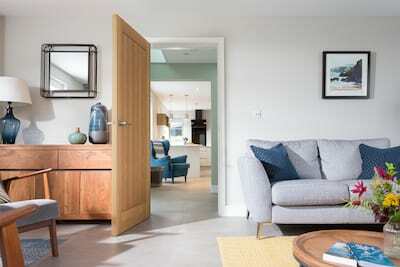 To complete the ground floor layout, Carkeen offers a smaller study room with relaxed armchairs and library of books whilst the inviting sitting room with wood burner and plenty of comfortable seating for all the party becomes the hub to the house at the end of the day. A central staircase leads to the first floor and collection of 4 luxury bedrooms, 2 double rooms and 2 twin bedded rooms. The master bedroom with ensuite shower room has been beautifully dressed in fresh whites and lilacs and creates a restful annex at the gable end of the house. A further double offers a boutique hotel style room with soft creams and natural hues, a wonderfully sumptuous room. The twin rooms offer a choice of azure blue décor or more country twist with chestnut leather armchair. Each room captures the verdant garden and established trees for a serene backdrop. A large family bathroom with deep bath and separate shower completes the first floor. The generous private garden really is set to impress with rolling green lawn just perfect for children to play and invites lazy days with friends and family. A wonderful slate terrace offers a slate and granite farmhouse table with 8 chairs. To the front of the house, pockets of garden offer further seating and quiet corners to escape the hubbub of the house. Herbs gardens brim with fragrant herbs in all seasons, rambling roses adorn the front porch and hardy evergreens flank the lawn offering a natural boundary. The lane to the front of the house is private with no through access other than Carkeen guests. From the rural North Cornwall location, pack up the car and head to the coast in 15-20 minutes. The popular surfing spot of Polzeath is a very short drive away and is a wonderful beach from action packed watersports to good old fashioned beach days. 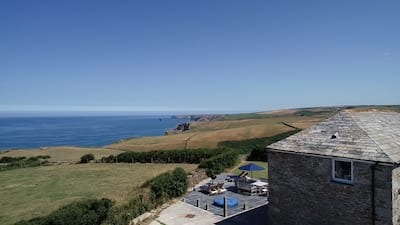 Further North enjoy the stunning scenery of Trebarwith Strand, Port Quin and the picture perfect coastal village of Port Isaac made famous by the Doc Martin series. If you are new to this corner of Cornwall or it is a favourite family stomping ground then you are well placed to explore the beauty and Cornish charm. If dining out is on the agenda then Wadebridge and Padstow offer tempting choices or enjoy the freshest of fish at Nathan Outlaws in Port Isaac. St Teath and the local country pub is within a 10 minute walk and accessed by a footpath from behind the house. St Teath offers a local shop and post office too. Gather friends and extended family and stay in farmhouse chic at Carkeen for a holiday to remember. Choose from 4 luxury bedrooms set over the 1st floor, each with personalised decor and colour theme. There is also an outside WC within the garden! There are 3 reception rooms within the ground floor. A dining room, study and sitting room. Carkeen is a beautiful house with everything that one needs for a perfect, tranquil holiday. I would recommend it to anyone looking for some time away from it all. And my sincere appreciation to the team who take care of the cleaning and housekeeping: excellent work!! We had a wonderful holiday - the property was superb - absolutely beautiful - the pictures simply do not do it justice. 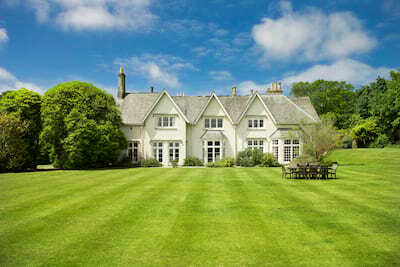 We were absolute delighted with the house and will definitely book again with Cornish Gems. Thank you so much. Fantastic property, lovely facitlities helped make a lovely family holiday. Easy road access to visit various beaches within resonable distance. Also lovely Pub in the village.